Yesterday marked the launch of The Shops at Target! This promotion features a specially curated line of products from small boutiques getting some exposure to the massive Target audience. I had been looking forward to checking out The Webster, specifically, ever since I came across one of their amazing necklaces a couple weeks back. (Read on to find out more!) After enticing TV commercials for The Shops drove me crazy with anticipation, my local Target store was turned into a colorful carnival with mini stations set up along the main aisles. I eagerly bounced from section to section to see where The Shops had set up, er… shop, and check out all the fun boutique goodies. Read on to see my reviews of each Shop’s offerings! This is the necklace that started it all. I got an advanced preview sample over at Marie Claire and I could not wait to see the entire Webster collection. It did not disappoint! For: Fans of classic pieces with a beachy, casual edge. I say: Menswear, Womenswear (including girls’s and plus sizes! ), Accessories, Shoes, Lingerie, and Swimsuits? What doesn’t Webster do? I’m most impressed with their clothes. (I picked up waaay too many new pieces!) Check out Target.com for Web exclusive pieces from this brand, but don’t miss out on shopping the fun layout of the store. For: Those who keep their homes just so. I say: Lots of fun pieces that you can add to your existing decor for a little flair. Simultaneously old world and modern chic. Some of the pieces aren’t that amazing: you could probably find similar pieces other places. Style In 5 Words: Martha Stewart meets farm chic. For: Rock princesses who can appreciate body scrub that comes in an animal print jar. I say: I wasn’t blown away by my Target’s selection of Cos Bar products. As a beauty junkie, I was hoping for the color cosmetics that were being used in the TV commercial. Really, the selection was limited to body butters, pedicure tools, and lotions. If you want a piece of the line, I’d suggest a funky $3 nail polish. The actual Cos Bar is much more luxe. Style In 5 Words: Prom weekend pedicures and pampering. For: Fashionistas who don’t deny their puppies the finer things in life. I say: I don’t have a dog, but I can imagine dog owners going crazy over the selection. 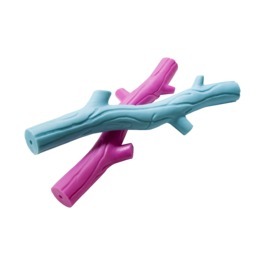 I like these fetch sticks (although they might be a little cruel to your color-blind companion. They’ll just look like regular sticks!) Have your pet rock the neon trend with bright water bowls, leashes, and collars. Don’t forget- they’re a bakery. Cute shaped baked goods make great rewards if your puppy finds this throw toy in a beaver dam or something. Style In 5 Words: Neons and Yummies for Fido. I say: Wasn’t impressed here. $5 for a small jar of Razzles? No. The jars were more appealing than some of the candies. Some products have more of a private candy store appeal. 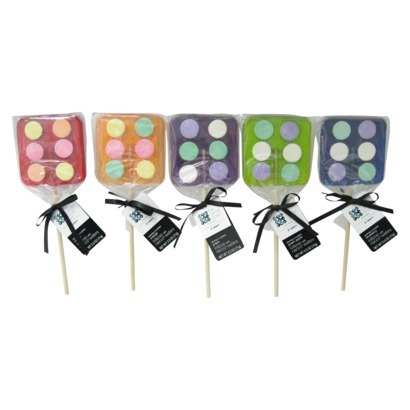 If you want to pick up a sweet treat, try their specialty pieces like the lollipops below. Style In 5 Words: Dylan’s Candy Bar 80s Edition. Kristine is a writer from New Jersey. When not quoting Tolstoy or catching up on her Twitter feed, she can be found watching iCarly or perusing the clearance racks at Bloomingdales. I got The Webster’s pink blouse with like the flamingos on it. Totally cute! The Webster’s collection is really spot on. Fun Miami prints that look fab. Your dress really pops. Thanks for the reviews; I’m checking my Target now. Welcome to The Collabor-eight, a collaborative blogazine originally founded by a group of 8 budding NYU journalism students and their friends.